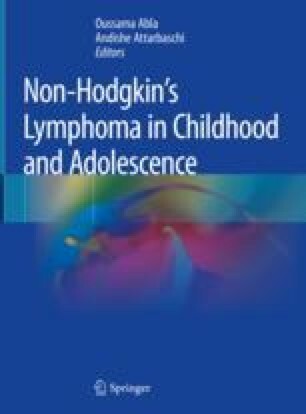 While cure rates for pediatric non-Hodgkin lymphoma remain to be among the highest in pediatric oncology, this often comes with a significant cost in the form of delayed effects of therapy or secondary malignancy. Various strategies have been developed to address the challenges of maintaining current overall survival rates for low and intermediate stage patients while further improving treatment outcomes for advanced-stage disease and minimizing long-term morbidities for all. Personalized therapy will be needed based on risk factor assessment and incorporation of new agents with improved toxicity profiles to upfront therapy protocols. Immunotherapy relies on delivering greater specificity to a cytotoxic agent and/or enhancing the patient’s own immune response to malignancy. This can be accomplished using precise targeted monoclonal antibodies, immune checkpoint blockade, or the development of improved chimeric antigen receptor engineered T-cells. There is increasing data for the efficacy of adding monoclonal antibody therapy, either naked or conjugated, to upfront cytotoxic chemotherapy. Checkpoint inhibition and the use of CAR T-cells are newer additions to the therapeutic paradigms for pediatric non-Hodgkin lymphoma, but results from adult trials are encouraging. It remains to be seen what best combinations will prevail as we move forward with these novel agents so that we may improve long-term outcomes for all.